High-fidelity patient simulators are life-like manikins that react physiologically as if they were alive. These advanced manikins are used to recreate real-life situations and provide learners with an opportunity to practice and refine clinical skills without the risk of patient harm. High-fidelity simulations extend beyond the simulator and include the surroundings, equipment, and modes of communication, to help learners suspend disbelief to fully immerse themselves into the experience. iStan is a life-like adult manikin whose software and functions are manipulated at a distance by simulation experts or facilitators, facilitators to react physiologically as if he was alive. Manikin control from a remote location and out of view of the learners contributes to the realism of the scenario and fosters independence in clinical judgment while learners utilize available resources (equipment, manuals, peers, etc.). Learners can perform physical examinations on iStan to determine his condition, recognize deterioration, or monitor his improvement. A complete physical examination includes the assessment of vital signs (heart rate, respiratory rate, and blood pressure) and an appraisal of the patient’s head, neck, abdomen, limbs, heart, and lungs. Facilitators or simulation experts can manipulate all of these parameters to learn the differences between various health conditions and disease states. In addition, the manikin is equipped with a wireless microphone and programmed with select sounds words, and phrases enabling him to communicate during a scenario. He can also produce life-like breath sounds, heart sounds, and lung sounds. He has palpable pulses, visual capillary refill, and responsive pupils. A unique feature of iStan is his ability to secrete fluids. Clear fluid can be secreted from the eyes, ears, nose, mouth, crown of the head, and urethra while stimulated blood can be secreted from the chest and six other wound sites. The “patient’s” vital signs and symptoms will respond to blood loss and model that of a hemorrhaging individual. iStan’s software provides physiologically modeled data which can be displayed on a monitor that is visible to learners. These data include ECG output, respiratory rate, blood pressure, oxygen saturation, heart rate, and body temperature. This integrated software also comes with factory developed scenarios. Examples include healthy adult, anaphylaxis, pneumothorax, angina with cardiac arrest, anterior myocardial infarction, and COPD exacerbation. Upon request, simulation specialists create scenarios for personalized learning experiences In addition, iStan is programmed with advanced cardiovascular life support (ACLS) megacode scenarios developed by the American Heart Association. iStan provides invaluable student learning in a safe and supportive environment. Lucina, our adult female human patient simulator, has user-friendly software that is similar to that of our adult male manikin. Lucina is as lifelike as it gets, responding physiologically just like a human would. She has heart sounds, breath sounds, palpable pulses, pupillary response, the ability to secrete fluids and, the ability to speak! The newly released technology of SymEyes allows the display of various conditions in the sclera, pupils and eyelids. Examples include jaundice, hemorrhage, bloodshot sclera, keyhole pupils, ptosis, and cataract. She also has a realistic, flexible airway that allows for emergency procedures and a respiratory system that allows for mechanical ventilation. However, Lucina’s most unique feature is her ability to replicate realistic labor and childbirth experiences as well as common complications that occur before, during, and after birth. In addition, Lucina has multiple cervices that allow learners to practice realistic pelvic exams. The simulator has articulating joints and pelvic tilt, allowing a variety of delivery positions and childbirth maneuvers. She can even be placed in a squatting position for delivery! Lucina is primarily a birthing simulator and can be used for normal vaginal delivery, shoulder dystocia and breech delivery. Other scenarios include pre-eclampsia with seizures and post-partum hemorrhage. A simulated full-term fetus can be positioned in Lucina’s abdominal cavity where it descends and rotates through the birth canal. The baby has a realistic feeling umbilical cord that is attached to a simulated placenta. The baby, who weighs about 5.5 pounds, is flexible and has hip articulation, palpable landmarks, the ability to cry, and a mouth and nose that can be suctioned.. After delivery, the technology provides one- and five-minute APGAR scores based on how well participants manage the delivery. Both Lucina and her baby can be controlled from the bedside or at a distance. Lucina has sensors that can detect maneuvers performed by learners, records and integrates this information with software that shows improvements or deterioration in Lucina’s and the baby’s condition. An emulated maternal-fetal monitor displays maternal and fetal physiological data on a screen in the simulation lab for viewing by learners in real-time or later via video recording. Debriefing and coaching by facilitators helps participants gain insight into their clinical decision making. This state-of-the-science, maternal-fetal simulator provides invaluable experiences with common complications, life-threatening and rare situations in a safe and friendly environment. This wireless and tetherless high-fidelity five year old pediatric simulator HAL® S3005 provides experiences in caring for children. Learners have the ability to orally or nasally intubate him and the manikin can simulate right mainstem intubation or gastric inflation if performed incorrectly. He has sounds in his upper airways, lungs, heart, and bowels as well as carotid, brachial, and radial pulses. His pupils will respond to light, just as a real patient’s would. He also has injection sites on his shoulders and thighs and intraosseous access at the tibia. The simulator can simulate central cyanosis, or lack of oxygen in the blood, by turning his cheeks blue. This pediatric manikin can also “talk” through pre-recorded vocal sound clips or wirelessly through an instructor headset. The software that runs this simulator allows facilitators and simulation specialists to manipulate the manikin’s physiologic states and conditions from a distant control room. Learners are able to see the changes simultaneously in the manikin and on the vital signs monitor that is mounted in the room while the simulation unfolds. A unique feature of Gaumard simulators is the ability to file share images, lab results, or multimedia presentations to the monitor in the room. The manikin comes preprogrammed with many scenarios, but simulation specialists also have the ability to create their own. This manikin also has an important place in teaching CPR. Learners can perform chest compressions on the manikin, and the software will evaluate the quality of their efforts. The manikin has lung compliance refined to deliver chest rise when ventilating at 20 cm H2O with ventilations measured and logged. The simulator allows defibrillation, cardioversion, and cardiac pacing with real energy. This state-of-the-science, pediatric simulator provides invaluable experiences with common complications, and life-threatening but rare situations in a safe and friendly environment. The addition of Pediatric Hal to our growing “family” of simulators was made possible through a grant from the Maryland Clinical Simulation Resource Consortium (MCSRC), a statewide funding initiative, which is part of the Health Services Cost Review Commission (HSCRC) Nurse Support Program II (NSP II). Salisbury University was the recipient of a 2018 Maryland Clinical Simulation Resource Consortium (MCSRC) Equipment & Materials Award in the amount of $61,678.00 to support the acquisition of a new high-fidelity newborn manikin. 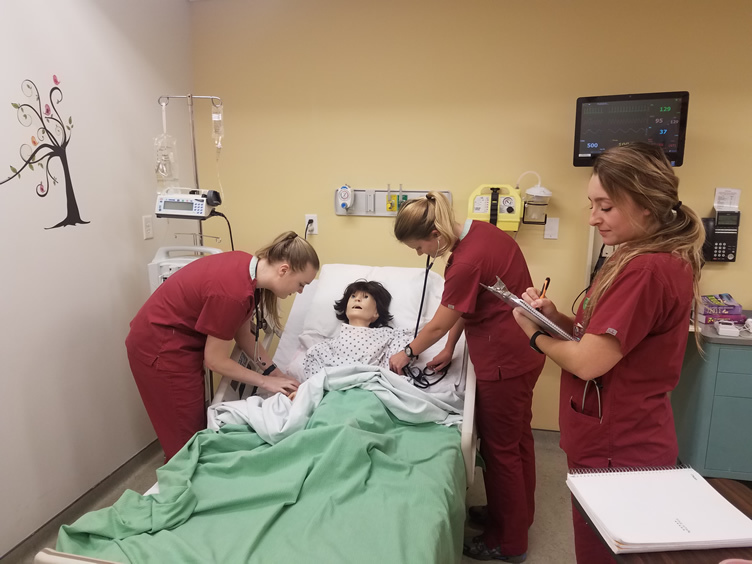 The goals of the MCSRC are to promote the use of simulation in nursing education in Maryland, establish simulation quality guidelines that will promote patient safety, and provide resources to maintain simulation equipment for nursing programs. The Medical Simulation Center proudly welcomes Super Tory, a high-fidelity newborn patient simulator, manufactured by Gaumard Scientific. Super Tory is a newborn simulator that gives our students the opportunity to rehearse real-life health care scenarios with confidence and ease. Baby Hal, Super Tory’s predecessor has given our students many years of life-like practice before heading into the real-world, clinical setting. Super Tory a wireless and tetherless manikin with cutting-edge anatomical and physiological characteristics that allow for a more realistic experience. This manikin has programmable heart and lung sounds, detectable pulses and blood pressure reading capabilities. Super Tory features realistic skin and programmable movements including seizures, limb flexion and extension, eyes that open and close, and gasping and clenching actions of the mouth. This simulator also exhibits an anatomically accurate airway for intubation and permits SpO2 and EtCO2 monitoring with real sensors. The new respiratory system design is capable of accepting mechanical ventilation support while adjusting pulmonary function. These advanced features allow for a physiologically accurate progression through respiratory disease via treatment, weaning, and rehabilitation. Along with the ability to accept real energy with defibrillation, cardioversion, and cardiac pacing, Super Tory also features eCPRTM real-time quality feedback and reporting to assist with CPR practice and mastery. Baby Hal is a 5 ½ pound newborn wireless high fidelity simulator with a very extensive list of features. He has independent chest rise with lung, breathing, and airway sounds. He can be orally or nasally intubated. Additionally, Baby Hal has heart sounds and palpable pulses. He has the ability to become cyanotic and visibly shake. It is also possible to insert an intraosseous needle in the tibia for the infusion of fluids, blood, or drugs The baby’s software comes with scenarios such as healthy baby, asphyxia, pneumothorax, transient tachypnea, meconium aspiration syndrome, and mild respiratory distress syndrome. Facilitators and simulation specialists also have the ability to create and save unique scenarios for personalized learning experiences. Monitor displays include EKG, respiratory rate, blood pressure, oxygen saturation, and heart rate. 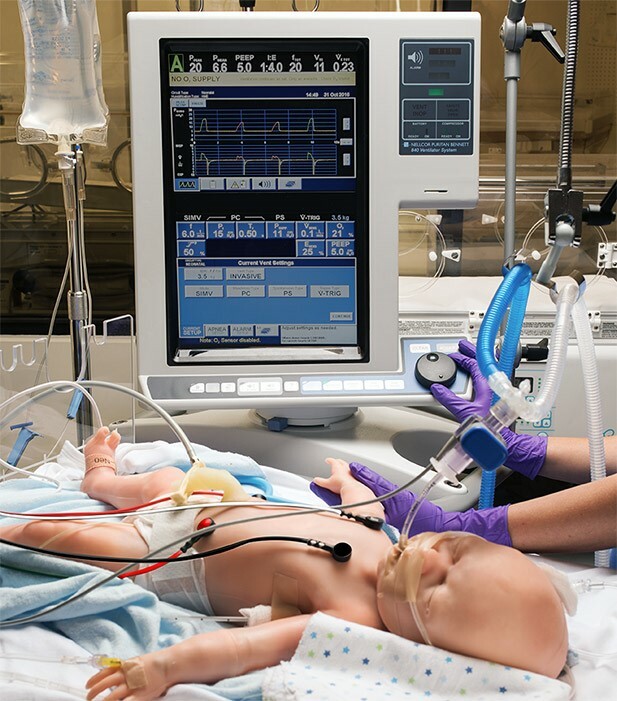 The ASL5000TM provides ventilator training and ventilation management by simulating almost any breathing profile imaginable – from newborn through adult. Using the ASL5000TM, real life respiratory scenarios can be created to meet the full spectrum of challenges including coughs, apnea, active exhalation, snoring and more. A unique feature of the ASL5000TM is its ability to breathe spontaneously while being ventilated, allowing learners to adjust ventilator settings and respond to patient parameters in real time to understand effective ventilator therapy. This simulator also has the potential to provide learners with hands-on experiences managing rare, catastrophic events, all within a safe environment. This simulator has several unique features including the ability to program the software for parameter changes to facilitate the development of standardized scenarios for a variety of learners. The interactive control panel, however, facilitates breath by breath control with the capability to make on-the-fly changes in patient parameters as well. More than 90 patient parameters are recorded during simulation for data analysis and debriefing purposes. This allows learners to evaluate the performance of the ventilator, evaluate the performance of respiratory therapy devices (e.g. CPAP, aerosol drug delivery devices), and evaluate their mode of ventilation selection. This simulator is the only neonatal spontaneously breathing simulator worldwide and it is available for use right here at SU! Other non-health care related applications include use by learners enrolled in Differential Equations or Calculus I for Biology and Medicine at Salisbury University who calculate models and graph three physiological respiratory physiological parameters: the lung’s volume across time, the gas flow of air into/out of the lungs, and the pressure at within the airway required to maintain proper ventilation during inspiration and expiration. While at the simulation center in conjunction with a respiratory care practitioner, they have the opportunity to test their calculations on the ASL5000TM. This activity bridges the gap between a mathematician’s understanding of the equations and complex mathematical models underlying the graphs and a respiratory therapist’s understanding of the physiological implications of, and recommended treatment for, a patient in experiencing respiratory failure.